Enlarged lymph nodes in the neck frequently come with common infections like flu, common cold, strep throat, etc. But they can also be cancerous growths! The symptom of isolated swollen lymph nodes in the neck region is an example of localized lymphadenopathy. There can also be concomitant swelling of lymph nodes in the different regions of the body (e.g. inguinal region, armpits, neck, etc.) and this is referred to as generalized lymphadenopathy. There may be other associated symptoms not confined to the region of enlarged lymph nodes. The symptoms will depend upon the exact cause of the condition causing the swollen lymph nodes and are highly variable. Lymph nodes enlargement usually is caused by an infection or any malignant growth (tumors) in body. Less commonly, disorders of immune system like systemic lupus erythematosus (SLE), rheumatoid arthritis, etc. can result in lymph nodes enlargements. Infections - Various common infections in the head and neck region like common cold, strep throat, gingivitis, ear infections, flu, infectious mononucleosis, upper respiratory tract infection, mumps, etc. can cause enlarged lymph nodes in the neck. Cancers - Various cancers can result in swollen lymph nodes in the neck. Cancers originating in the lymphoid tissues, like lymphomas (Hodgkin and Non-Hodgkin) can cause localized lymphadenopathy in the neck. Leukemia ("blood cancer") can also result in enlarged lymph nodes in the neck region. Almost any cancer can cause enlargement of lymph nodes when it spreads (metastasizes) to the lymphatic system. Cancers of head and neck region (oral cancer, larynx cancer) can cause swelling of the lymph nodes in the neck region. The lymph nodes in the region above the collar bone (supraclavicular lymph nodes) are particularly notorious in this regard and there enlargement requires thorough evaluation for any malignant growth in chest or abdomen. Treatment of such swollen lymph nodes will depend upon the cause. Due to infections - Usually these swollen lymph nodes are caused by infections. Swelling of supraclavicular lymph nodes require immediate medical evaluation for any malignant growth. Enlarged lymph nodes due to infections are generally painful and require warm compresses and NSAIDs (like acetaminophen or ibuprofen). Antibiotics are given if bacterial infection is suspected. Surgical drainage may be required if abscess formation is suspected in the enlarged lymph nodes. 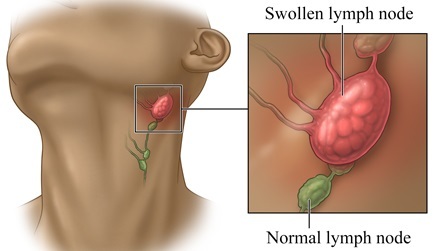 Due to cancers - Treatment options for swollen lymph nodes in the neck region due to cancers are surgery, radiotherapy and/or chemotherapy depending upon the type, location and spread of the cancer. Generally, the cancer is quite advanced by the time it causes the enlargement of the lymph nodes (except tumors of lymphatic system like lymphoma that originate in the lymph nodes itself).